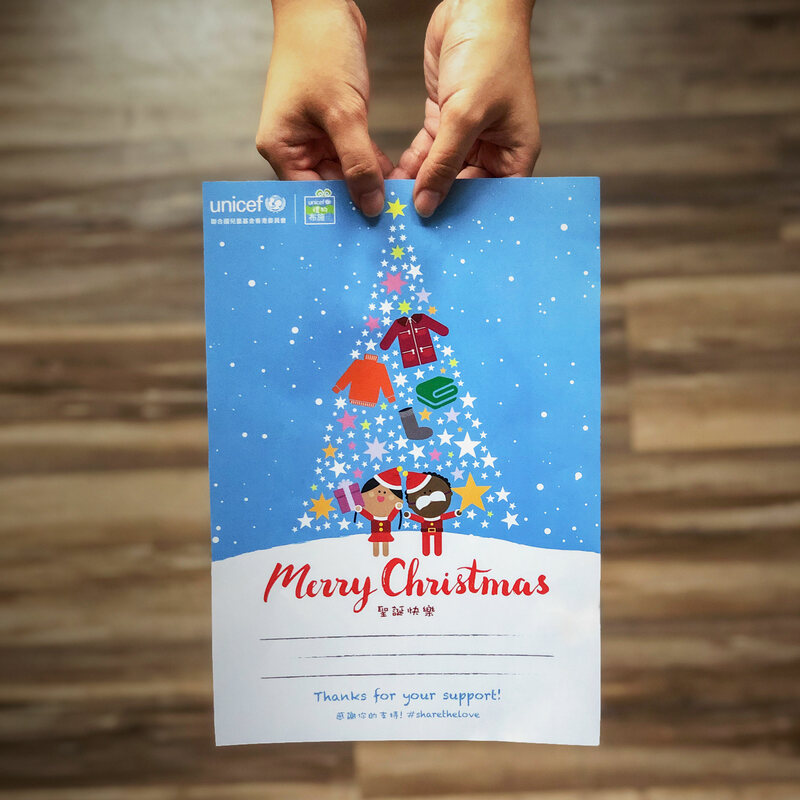 UNICEF Hong Kong presents the Inspired Gift Christmas set and Christmas card for the upcoming festival. With just a small donation, you can bring warmth and joy to children in need over harsh winter! When you purchase an Inspired Gift on our website, you can send a Christmas e-card with a custom message to your family and friends. Let’s share blessings of a hearty Christmas with our loved ones and the deprived children! Donate $162 and buy 6 UNICEF Waterproof School Bags. Each contains ultracomfy shoulder straps, mesh lined, 2 inner and 1 outer pocket and a name tag. Donate $468 and buy 9 Blankets. These warm, fleecy thermal blankets help keep children warm and healthy. Donate $642 and buy 2 sets of Life-saving Winter Clothing Kit. Each includes jackets, trousers, fleeces, socks, boots or strong shoes, a scarf and a hat. You can also add an extra Christmas card to your purchase in the shopping cart for the purpose of Christmas gift exchange. About Hong Kong Committee for UNICEF (UNICEF HK): Hong Kong Committee for UNICEF (UNICEF HK) was founded in 1986 and was established as an independent local non-government organization to raise funds through public donations, partnerships with companies, special events, etc. to support UNICEF’s work. 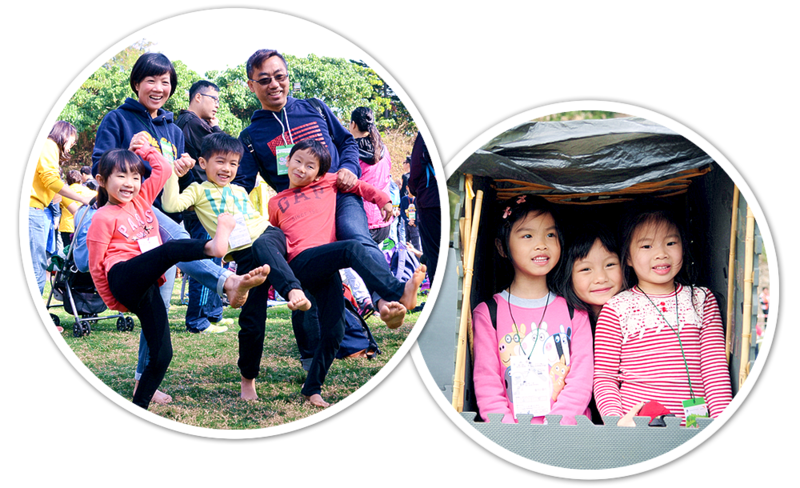 UNICEF HK also promotes and advocates for children’s rights via organizing education and youth programmes in Hong Kong. Don’t miss Room to Read’s 2018 Gala on 2 March! 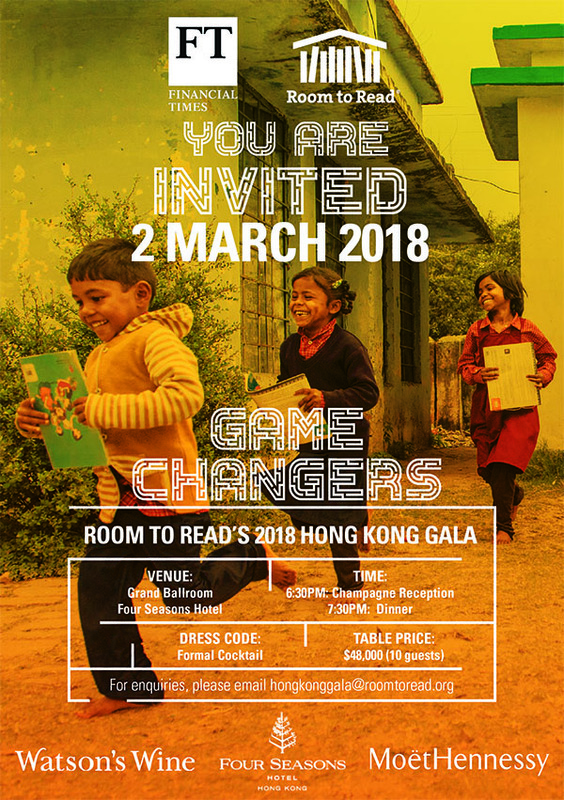 Please join Room to Read‘s Hong Kong Chapter to get Active for Education and be a Game Changer at Room to Read‘s Hong Kong Gala on Friday 2 March 2018. 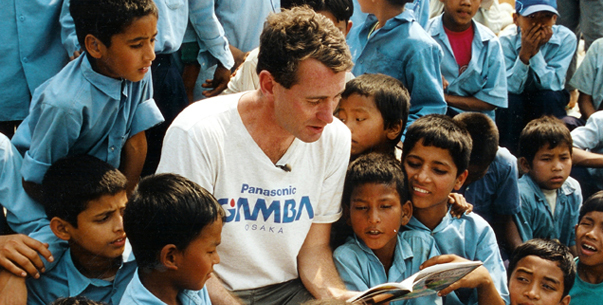 Join Room to Read‘s Founder John Wood and their APAC Board members to celebrate and be inspired by their game changers in the making – young learners around the globe empowered through their programs to be their best selves. Enjoying a hearty meal with your loved ones is probably a must-do during Chinese New Year, but have you thought about spending a day out with them in the countryside this year? 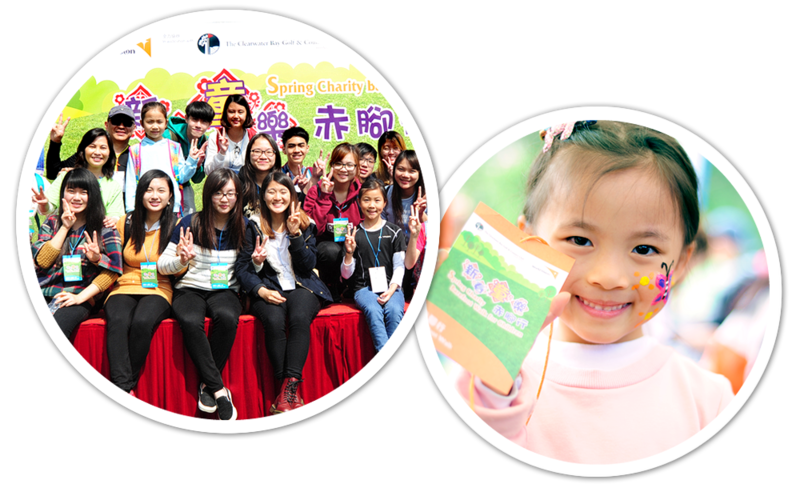 Take your children, invite your relatives and co-workers to the Spring Charity Barefoot Walk for Children 2018. You will have a great time while doing something meaningful. All proceeds from this event will go to World Vision’s integrated health and water, sanitation and hygiene (WASH) projects in South Sudan to help South Sudanese children and families affected by the ongoing conflict in their country and provide them with much-needed basic necessities and food assistance. Categories: Take a 4km journey without shoes on to “experience” displacement of South Sudanese children. Check out the booths and activities after the walk to learn more about the challenging life of South Sudanese people. In addition to the Barefoot Walk, Take part in workshops to learn more about the lives of families displaced by war. Try building a simple makeshift tent and a latrine, and fetching water in the settlement. Use your imagination, let it guide you to the surroundings of the displaced and understand their plight. About World Vision: World Vision is an international partnership of Christians whose mission is to follow our Lord and Saviour Jesus Christ in working with the poor and oppressed to promote human transformation, seek justice, and bear witness to the good news of the Kingdom of God. Social Career is a non-profit technology organization registered in Hong Kong in 2015 and a registered charity under section 88 of the Inland Revenue ordinance (File no: 91/15011). 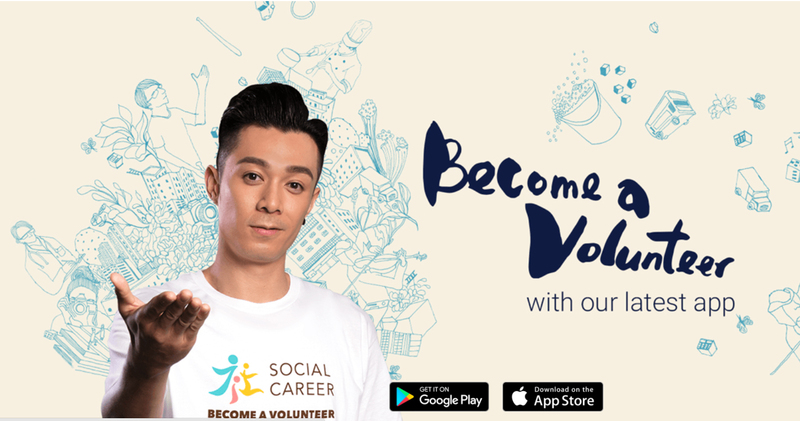 With funding support from The Hong Kong Jockey Club Charities Trust, Social Career is building a platform that encourages the general public to volunteer and get involved in social causes and service activities. Their vision is to be in a world where everyone has a second career outside of their work. Everyone deserves an opportunity to develop a second career that we are truly passionate about. They call this our Social Career. You can have a fulfilling Social Career regardless of your profession, education or your social status; it’s about who you are and your impact on society through volunteering. Your Social Career will carry on even after you have retired from your daily job. Social Career’s mission is to educate the general public in volunteerism and involvement in social causes and services. To achieve this mission, they devote their knowledge and experience of applying latest information technology to develop a platform that helps non-profit organizations and enterprises with a social mission to encourage and manage long-term and skill-based volunteering activities. Just register by following this link, look at the volunteer opportunities on their website or on their app. Like it? Sign up, it’s that easy! Asylum seekers and refugees (ASRs) have limited rights in Hong Kong and they are a group of marginalized and ignored population. Due to the backlog of the screening process, it is not unusual for an ASR to stay in Hong Kong for years, some of them have stayed in Hong Kong for over ten years. They are prohibited to engage in any form of businesses or jobs, except in rare exceptions. During the lengthy screening process and long waiting time, ASRs can only live under limited government and NGO subsidies. Despite their long stay, they are often detached from the society and there is little public awareness of their presence in the city. Health in Action is a humanitarian organization established in 2011 in Hong Kong, with a focus in promoting community health and wellbeing through the empowerment of underprivileged populations in Hong Kong and in Southeast Asia. Their work is rooted in the core belief that every human being has the right to health. They offer support to people based on health needs, irrespective of race, religion, gender or political affiliation. Health In Action is a registered charity in Hong Kong and is a member of the Hong Kong Council of Social Service. 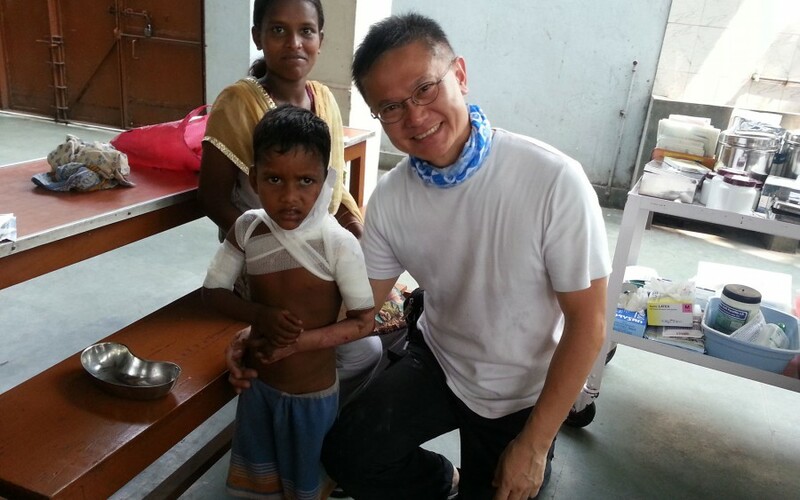 Health In Action advocates health equity for the underprivileged, including ASRs in Hong Kong. The right to health implies that the government should provide accessible and acceptable basic healthcare to all living in the city. This also includes other health-related services such as nutritious food and safe housing etc. The right to health enshrined in international human rights treaties, such as International Covenant on Economic, Social and Cultural Rights, is applicable to Hong Kong. ASRs can attend basic medical services at public hospitals with their fees waived. However, experience from ASRs show that there are multiple factors hindering their health care access, including cultural differences, language barrier, lack of awareness of health needs and financial constraints. All these impose negative effects on the physical and mental health of ASRs. Volunteers are Health in Action’s core valuable assets. Their committed team of multi-disciplinary volunteers is continuously expanding, with professionals including doctors, nurses, pharmacists, dietitians, occupational therapists, clinical psychologists, social workers, lawyers and more. University students are also a crucial part of their taskforce. Health in Action welcomes volunteers of all backgrounds and experiences to join them in working towards health equity. If you are interested in joining Health in Action as a volunteer, please do not hesitate to let them know by emailing hia@hia.org.hk. 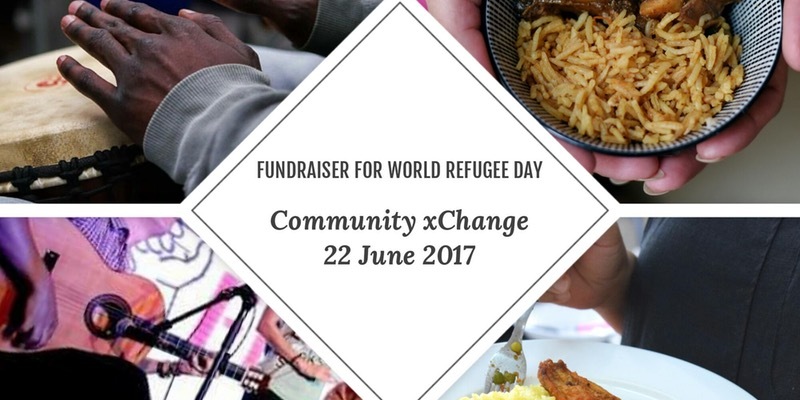 To commemorate World Refugee Day (June 20), Table of Two Cities is bringing artists from the refugee and local community to showcase their talents and cultures with live music, DJ, and homemade munchies prepared by wonderful refugee chefs from Togo, Uganda, the Philippines and Indonesia! All proceeds after costs will go to Refugee Union (Sister organization: Vision First). Of course, donations are welcome!! To be the union of protection claimants in Hong Kong with the aim of safeguarding refugee rights and improving the protection, wellbeing and future prospect of all refugees. To empower members to selflessly assist each other and actively participate in all matters relating to the life of refugees and the development of the asylum sphere in Hong Kong according to the highest standards of human rights. Imagine That! is a non-profit community arts festival that will take place in Hong Kong from 17-19th June in the lead up to World Refugee Day (20th June). Show solidarity for the refugees in Hong Kong and abroad through the reclaiming of our public space and connecting the community through arts. Arts has been the centre of the Refugee Art Movement’s workshops with refugees and asylum seekers. It has been a vehicle for frienship across barriers and now the Refugee Art Movement wants the same to happen beyond their workshops; in our city! 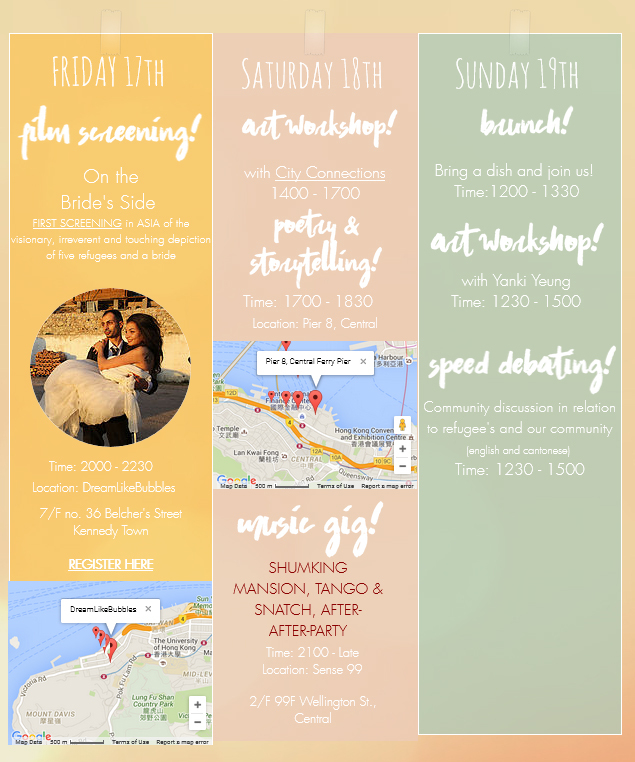 There’s film, a poetry slam, art workshops, brunch, speed debating, much to do and learn from! About The Refugee Art Movement: The Refugee Art Movement is a student led initiative that provides arts orientated workshops for refugees, asylum seekers and the wider community in Hong Kong. Started in Hong Kong by a group of students and staff at the University of Hong Kong in August 2015, they wanted to connect people from different socio-economic backgrounds and cultures to build long lasting friendships in Hong Kong. The Refugee Art Movement uses art, drama, film, photography, music and more to encourage cultural exchange in this diverse city, mutual education and friendship. In addition, the project aims to educate people about the realities faced by refugees and asylum seekers within Hong Kong and around the world. The Refugee Art Movement knows from experience that there are so many people with a passion for arts, education and humanitarian issues and so they work to bring them together to use their skills for the benefit of our society. For more information about their work, please visit their Facebook page.